Just another reason not to vote for any of these characters. Speaking to the Council on American Islamic Relations at a March fundraiser, Omar talked about the difficulties Muslims faced following the Sept. 11, 2001, al Qaeda attacks. She claimed they saw their civil liberties infringed upon, and she referred to the events as an instance when “some people did something.” Her point was to praise CAIR for organizing in response. After the video went viral, Republicans and some Democrats in Congress voiced their disgust at the comment. 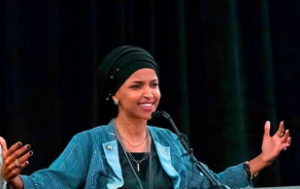 Trump tweeted out a video of Omar’s comments followed by footage of the airplanes flying into the Twin Towers and then the towers collapsing, sparking outrage from Democrats who believed criticism of Omar’s comment was “inciting violence” against her. Several 2020 Democrats, including Sens. Elizabeth Warren (Mass. ), Bernie Sanders (I., Vt.), Amy Klobuchar (Minn.), South Bend Mayor Pete Buttigieg, Gov. Jay Inslee (Wash.), and former Gov. John Hickenlooper (Colo.) have slammed Trump for his tweet.